Enrollment in these classes are planned to go through the entire school year or the entire summer. However if you need to opt out we require a 30 day written notice. I recognize that participation in activities such as gymnastics, tumbling, and trampoline can result in severe injuries, permanent paralysis, brain damage, or even death. Sports participation can be dangerous. Being fully aware of these dangers, I hereby give consent for my child(ren) to participate in any and all More Than Gymnastics and affiliated entities (SET-10 and Ninja Zone) programs and activities and I ACCEPT ALL RISKS associated with such participation. On behalf of myself and my child(ren), I accept all such risks and promise not to sue, and forever release More Than Gymnastics and Ninja Zone each of their respective officers, directors, shareholders, employees, contractors, invitees, licensees, and agents ("you") from all liability for damages or injuries incurred as a result of participation by my child(ren) or myself. This includes those injuries resulting from acts of negligence by you. I also waive all rights any third party may otherwise have to pursue claims against you on my behalf (including the right of subrogation). If, despite this agreement, I or any third party on my behalf makes a claim against you, I will defend, hold harmless and reimburse you for such claim and liabilities as a result of such a claim. All registrations are on a first come first serve basis. Tuition is due every 5 weeks. Tuition payments processed during the designated "Tuition Week". An email reminder for Tuition Week will be sent each active family. Payment for the installment must be received during the Tuition Week. NEW: I UNDERSTAND THAT IF TUITION IS NOT PAID DURING A DESIGNATED TUITION WEEK, MY CREDIT CARD ON FILE WILL BE CHARGED THE TUITION AMOUNT THE TUESDAY FOLLOWING A DESIGNATED TUITION WEEK. MORE THAN GYMNASTICS ASSUMES THAT ONCE I ENROLL IN CLASSES I WILL BE STAYING UNTIL THE END OF THE SESSION OF CLASSES. THE END OF THE SESSION FOR THE SCHOOL YEAR IS IN JUNE AND THE SUMMER SESSION ENDS IN AUGUST. IF I NEED TO UN-ENROLL, MORE THAN GYMNASTICS REQUIRES THAT I GIVE A 30-DAY WRITTEN WITHDRAWAL NOTICE. MY FINAL PAYMENT WILL BE FIGURED FROM THE DATE THE WRITTEN WITHDRAWAL WAS RECEIVED. I authorize More Than Gymnastics to charge my $25 Annual Membership fee to my credit card. This fee will be charged to the credit card on file per family and one time a year. 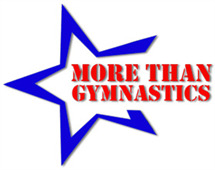 More Than Gymnastics makes payment convenient by allowing payment to be processed online. Payment through online registration must be made by credit card (Visa, Mastercard, or Discover). Cash and Checks are accepted with printable registration form and may be mailed in or handed to our customer service. There is a $30 fee for all returned checks. Every student is allowed 4 make-ups in the School Year Session and 2 make-ups in the Summer session. You may make up a class you have missed in the School Year session at any time during the School Year Session. You may make up a class missed in the Summer Session any time during the Summer session. No make ups may be carried over from 1 session to another. No credits or refunds will be given for classes not attended. A $25 non-refundable annual family membership fee is due upon your initial enrollment and is good until the next year of your enrollment date. The annual family membership fee will be charged to the card that is in your account the month of your initial enrollment. To find your membership date, sign onto your online account. The membership date is your registration date in the My Account tab, under your emergency contact information. Example: If your registration date is 3/24/2018, your membership fee would be posted to your account in March of each year. From time to time at More Than Gymnastics we take pictures of our students to use in our marketing campaign. I hereby grant permission for my child(ren) likeness to be used in More Than Gymnastics's and Ninja Zone's publicity or advertising. If there is a picture of your child and you want us to discontinue using it just let More Than Gymnastics know.